For more than 40 years, the only thing Seattle folk singer/restaurateur Ivar Haglund was better at than slinging "acres of clams" from his waterfront fish bars was almost single-handedly ensuring Seattle had fireworks on the Fourth of July. 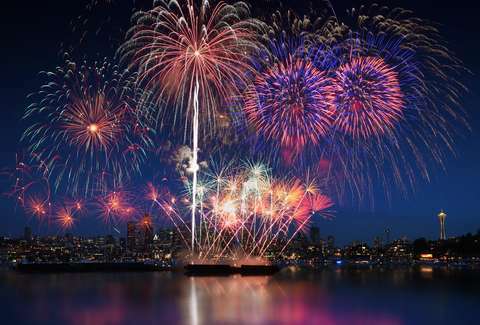 First on Elliott Bay and then on Lake Union, where in 1984 the city had the biggest holiday pyrotechnic display in the nation -- and it still continues today. Speaking of crowds, there's a reason this unique park draws as many as 40,000 people for the Fourth: You feel like you're right beneath the fireworks. Plus there's live entertainment, street food vendors, traditional games like sack races and pie-eating contests, and most importantly, a beer garden. Best of all, Gas Works now has reserved seating if you want to shell out a few dollars ($40-$60), and an arrangement with Uber to drop-off/pick-up people in a dedicated zone of N. Northlake way, since no one in their right mind would consider driving themselves. The patio at this divey and beloved Capitol Hill locals' bar is a garden oasis, with trees and greenery that typically creates a low-key experience that would almost make you forget you were in the city... save for the amazing view of the Space Needle and Lake Union, which is why on the Fourth it promises to be packed. But totally worth the hassle and free to the public. If you've got a boat, you've already got a great place to watch the fireworks. And if one of your friends has a boat you've got an even better place to do it… think about it: you get all the same benefits but you don't have to worry about cleaning up, or not hitting other boats in the dark. Or, you know, buying a boat. If neither of those things is an option there are several booze cruises, including waterways cruises, and Seattle Boat Parties. Unfortunately, Argosy is sold out. As the smaller of two official public viewing locations, this MOHAI-adjacent park flies a little under-the-radar as a place to watch our annual series of controlled celebratory explosions. But it’ll still be packed with people hoping to avoid even worse crowds at the north end of the lake, and taking advantage of the beer garden, food trucks, and other diversions on offer that night. Westward, what with its excellent food and man-made beach out front is probably the best restaurant/bar on the shores of Lake Union. 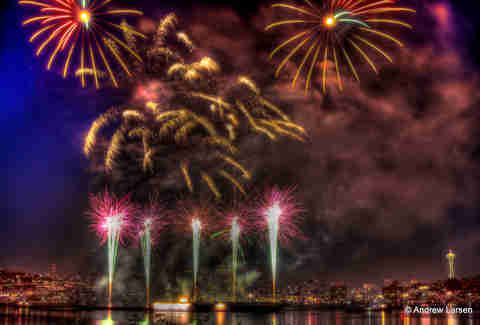 And probably the best choice if you're looking for a place to watch the fireworks. But unless you're one of the lucky few to score a ticket to their sold out holiday party, you better pick someplace else, like Chandler's Crabhouse on the Southern shore, or White Swan Public House off Fairview, in the space that used to be A Terrible Beauty, and BluWater Bistro, and… well, you get it. The Fourth is the only day of the year Keira Knightley's favorite Seattle bar (she was spotted here whilst filming a movie five years ago) takes reservations (for free), but only for large groups. So email 'em if you've got 6 or 8 people down to toss back local suds and a ton of tequila on their sprawling deck, which might just offer the most intimate view of the evening's festivities. 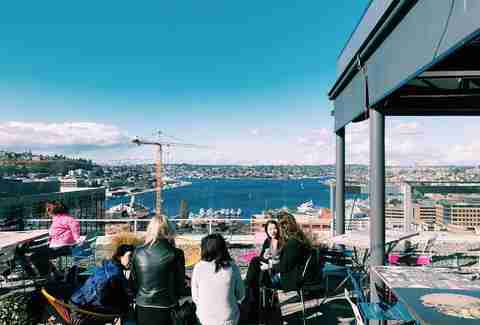 This sprawling outdoor/indoor boozer on the 14th floor is one of the best rooftop bars in the city, and boasts unbeatable views of… well, basically the whole town, but especially of Lake Union just two blocks to the north. Here $80 gets you into their second annual Fourth of July party featuring a badass mezze buffet, DJ's, and that aforementioned view. If that's not good enough, they'll also be selling some brand new nutty booza -- the ice cream collab between Nutty Squirrel Gelato and Mbar's owners Mamnoon -- flavors as well. Shhhh… this street corner on the Northwest "corner" of Capitol Hill -- at the intersection of Bellevue, Bellevue and… Bellevue (seriously!) -- is still a relative secret that attracts mostly locals who don't want to deal with huge crowds or, more likely, couldn't get a seat at the aforementioned Lookout, which is just down the block. Named for a guy who used to live in the area, this free park's unique design features a steep, winding trail that provides surprise vistas to the Cascades, Downtown Seattle, and Lake Union (duh!) as you move toward the top of the park, where you'll find a handful of benches and low stone walls you can sit on to watch the show. Provided you get there early enough since this place will draw a crowd. 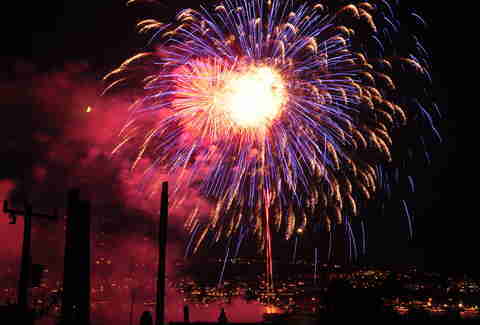 Bradley Foster is a former Thrillist editor who will probably watch the fireworks on TV. But don't tell anyone.